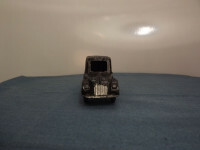 This model is the Charbens #13 Police Van in black. This is the first issue of the casting as it is 79mm long, the later issue being 87mm long. The model of the delivery van has a one-piece, cast metal body, 79mm in length, 38mm high and 28mm wide. At the front is a silver painted grille, headlights, and front bumper. The sides of the bonnet have engine louvres cast on each side and a central "hinge" down the middle. The body sides have rudimentary lines cast to represent the side and rear doors and body lines. 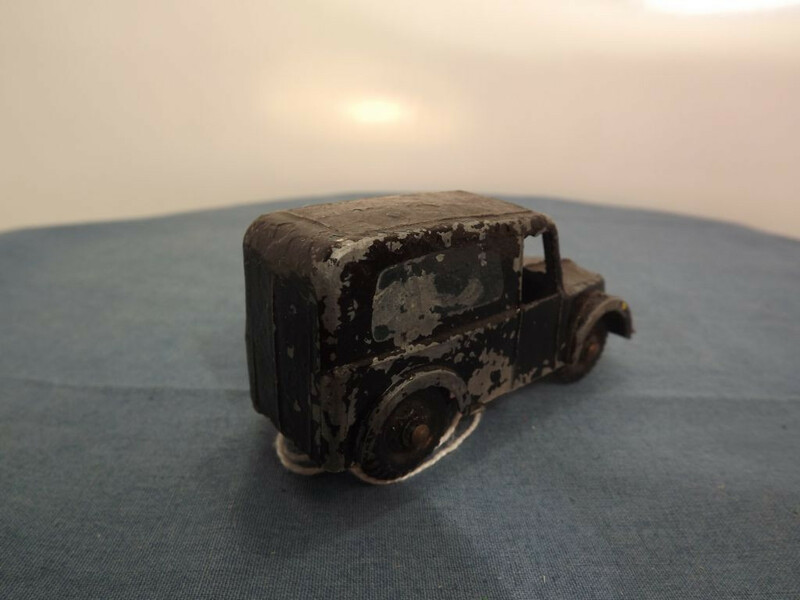 The original paper "Police" labels are very worn on this model and illegible. 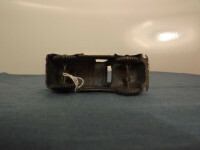 The model is fitted with black painted metal wheels fitted to steel axles that are held in place by being pinch-crimped to the four under body pillars. 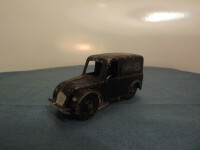 There is no base to the model, the underside of the body is simply marked "Charbens" towards the rear body pillars and "Made in England" on two lines in front of this. This item was first issued in the late 1940s to the early 1950s using the same body casting used for other vans. 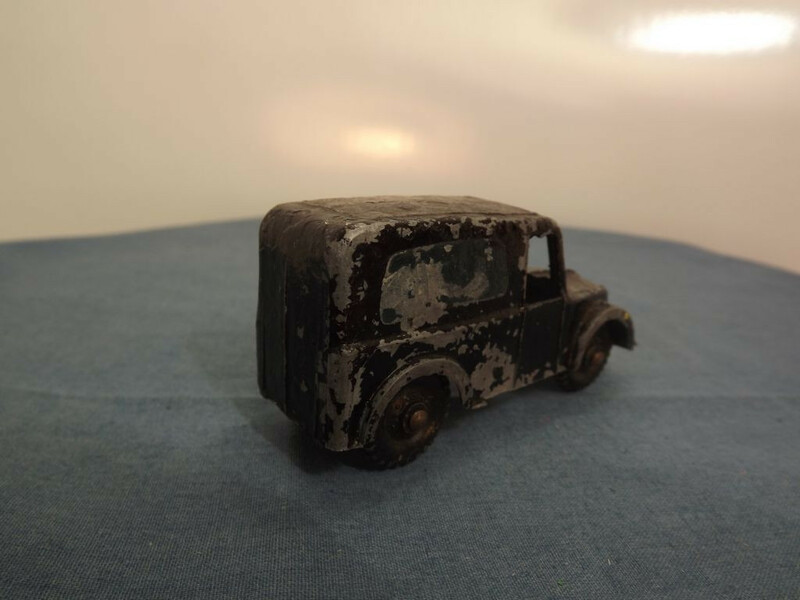 A new casting was issued in the 50s and is clearly different as it is longer and more closely resembles the Ford E83W delivery van. 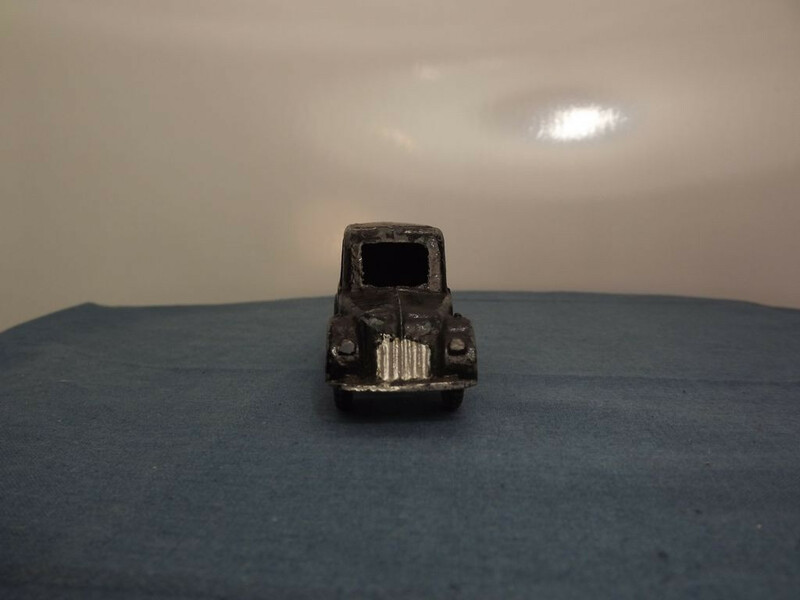 This model is the Charbens #13 Police Van in black. This is the second issue casting as it is 87mm long, the earlier issue being 79mm long. The model of the delivery van has a one-piece, cast metal body, 87mm in length, 44mm high and 31mm wide (35mm at the wheels wells). It resembles the Ford E38WA but may be a Morris Y-type 10cwt van. At the front is a silver painted grille, headlights, and front bumper. The sides of the bonnet no longer have engine louvres cast on each side as on the earlier casting, nor the central "hinge" down the middle. The body sides have rudimentary lines cast to represent the side and rear doors and body lines. The original paper "Police GR" labels are very worn on this model but still faintly legible. This version of the van has rear door windows. The model is fitted with black painted metal wheels fitted to domed and crimped, steel axles that are held in place by being pinch-crimped to the four under body pillars. 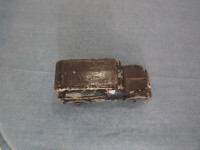 There is no base to the model, the underside of the body is simply marked "Charbens" towards the rear body pillars and "Copyright" on a single line under the bonnet. This item was first issued in the late 1940s to the 1960s.